We understand that farming does not operate on a 9-5 basis therefore we answer calls 24/7 and are flexible enough to cater for any run outs or emergency deliveries to keep you going when you most need to. We can supply your fuel requirements from Red Diesel & IHO to Kerosene, ULSD, Lubricants, Adblue and more at great prices. Speak to a local expert, leave an enquiry or check out our product pages for more information. Our team of oil delivery drivers have vast experience of delivering fuel oils onto farms, building sites and industrial sites. 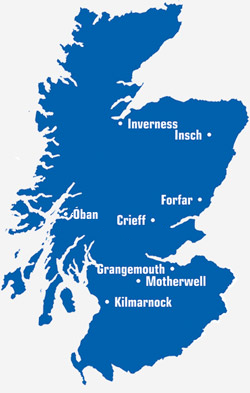 We deliver road diesel in bulk throughout Scotland. Oilfast are authorised distributors of Q8, Total and Fuchs, all of which are premium brand lubricants.